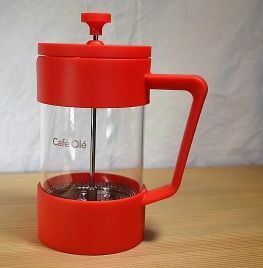 A 600ml everyday cafetiere - the Grunwerg Café Ole Studio in red. Make French press coffee in this straight-forward everyday cafetiere. No frills, just simple sensible design in vivid red. A plastic frame surrounds the heat resistant glass vessel which is good for 600ml of coffee - they say that's 4 cups: more like 2 to 3 of cafetiere coffee surely! !